Friday afternoon, one of the most exciting things that's ever happened to me took place (that is not hyperbole, sadly): I went down to check the mail, and I discovered a package from RunningSkirts. I was confused - I couldn't remember ordering anything. 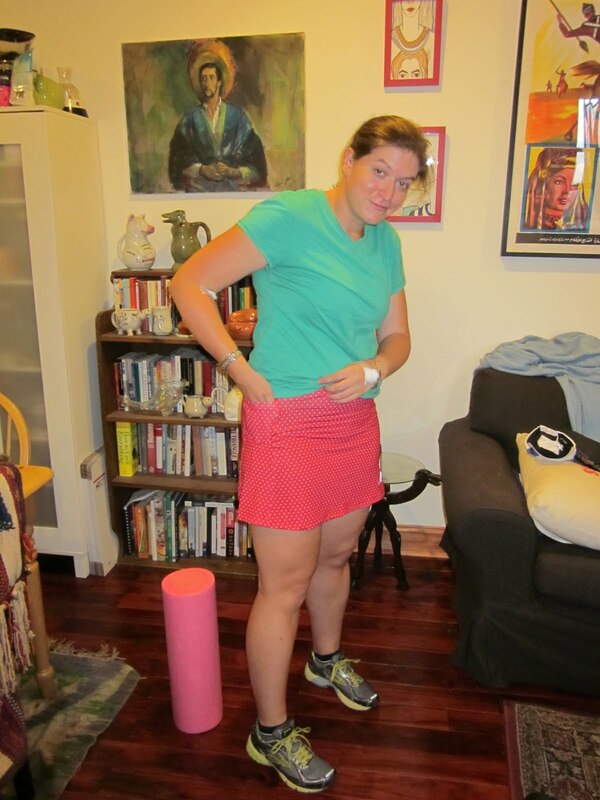 But it was plausible that I would have; I do love me a running skirt. Had I been sleep-shopping? ...again? I opened the package and, much to my delight, there was an adorable skirt and a pair of arm warmers,* compliments of RunningSkirts, with a nice note inviting me to review the skirt. Don't mind if I do! Their description of the skirt reads: "Red and mini white polka dot print skirt in lightweight performance fabric. 2 Roomy Velcro closure pockets at the hips. Attached compression shorts with no chafe flat seams have a longer inseam for thigh protection and a fit that does not ride up. Inseam length 6-8". Let's start with the important details: I think the polka dots are really more pink than white. I was excited to see how generous the compression shorts were in length (pardon the slippers), so I put the skirt on to test it out. Pardon the messy house. And - just so we're clear - the foam roller is obviously a prop. Literally: I propped it up for the photo so I'd look like someone who uses a foam roller. The fit of the skirt is ideal. I love the length of both the skirt and the compression shorts. Their fabric is stretchy with a generous waistband made of the same fabric (no muffin top), which means you can wear it lower on your hips or higher toward your waist as you like. Once I'd adjusted mine, it stayed put. I don't really have a waist, per se, so I can't address how well the waistband would work on those with a more hourglass figure or who typically like a drawstring waist. 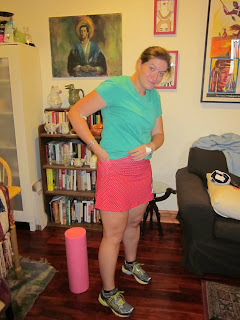 As a general note, I've owned two RunningSkirts in the past, and the sizing was slightly inconsistent between the two. One of the skirts I owned was quite large, so I sized down when I bought the next one - and found it to be, um, figure-skimming (aka tight). Given the stretchy fabric, the smaller size still fit easily. But it looked tight. I just noticed after wearing it to run that this skirt is one size larger than my typical pants size, but it fit well. What I see as this skirt's biggest drawback is the pockets. Specifically, there are two, one on either side at the hips. They are generous and square with a small piece of velcro to close them. I'm picky about pockets. I like them, I like a lot of them, and I like them to be secure and tight. I could easily see throwing a gel or two into these pockets, but my keys jangled (because the pocket wasn't quite tight enough) and my iphone fit, but awkwardly. Note that their website calls these "closures" instead of pockets, which I think is apt. The iphone pocket bulge doesn't look as awkward in this photo as it actually is in real life. The iphone can only fit sideways, which made it difficult to plug my headphones in. Once I started running I didn't really notice anything, though. I even got used to the keys jangling after a few steps. They weren't bouncing but simply making noise. Also note that the compression shorts are compression in name only - they're not overly tight by any means. The verdict? After 4 miles, I like this skirt and I will wear it regularly. It's comfortable and the compression shorts didn't ride up, nor did they chafe. In essence, it did exactly what I like my running clothes to do, which is perform well and not give me any reason to think about them. No pulling, no adjusting, no nothing but me and one of the best runs I've had in weeks. And, if you're into that sort of thing, the skirt is also kind of cute. The $68 price tag is steep, but it's not out of line with what running skirts often go for and RunningSkirts does offer sales periodically. I'm happy to consider myself a Skirthusiast. But don't take my word for it on this skirt's comfort. If you go over to my friend SillyGirl's blog, you'll see countless photos of her in different versions of this same skirt - a true testament to its wearability. And its versatility! She's about 6' tall and lithe, and I am... not. Yet we both look good in the skirt, if I do say so myself. Edited: Carla had a very different experience with RunningSkirts (and with the company) than I did, so be sure to read her review for a different perspective. I haven't worn this skirt for more than 4m, so I can't say whether the shorts would ride up after a longer run (or whether they'll be different after I wash them). If my review changes, I'll update this page. *Even though the weather today was nice and cool, 75 degrees is still a little warm for arm warmers, so review part two will have to wait. And honestly? I have two running skirts and NEVER used it again despite the cute print, not even for walking... I am still THAT traumatized. To be fair, I haven't worn them on a longer run yet - so I'll have to try it and see about the chafing. I remembered you'd reviewed one, but I didn't think to look your review up. I'll add it to the main body of the post. No, I think it's important. It's one thing to pay $30 for a skirt that chafes, but $68 is steep - I rarely pay $68 for skirts to wear to work! When I look at reviews, my biggest issue is a) how is the chafing, and b) do the shorts ride up? I think that, combined with your experience with their customer service, is good info. 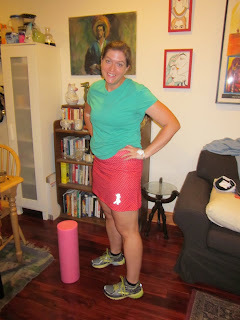 I love me some running skirts, but I am not a fan of that company. I tried to be, I really did. They were super sweet on letting me exchange my tri skirt for a athletic one (b/c when I ran with it, it became a belt) but I've never been able to wear it b/c it's still too small and it looks terrible on. I guess that's my fault. But seriously, not every runner is stick skinny. I don't think that's your fault. I'm glad to hear that their customer service did a better job for you than for Carla, but now I'm definitely curious to keep wearing this skirt and to see whether my initial positive impression holds. I hope so, because I liked it! Skirt looks great, by the way! I personally don't like the running skirts style with the shorts. They ride up on me and the waistband actually pulls down. I don't really have a problem with the pockets, but they could stand improvement. I agree that the price is STEEP. I've also had problems with their customer service in the past. And they are REALLY expensive for shipping. But. With that said. I have tons of their skirts, and I wore the red dot with a green tank on Christmas day for a 15 miler and it worked great. The skirt looks great on you, Tracy! For tight shorts that ride up because they are not tight enough: if you pin it on the sides so they are tighter at the hem, they won't ride up. Pinch about an inch (or less) and stick a safety pin (you know you've got tons of those) to leave a flap. The skirt will hide it. @carla, that might make yours wearable. I did that to a skirt from Ella Sport that was too big for me. It rode up even for short runs. I stuck the pins and can now wear it for long runs. I prefer wearing the smaller size that doesn't ride up, of course, but that way I can wear both skirts and not just one. And how did they get your mailing address? Just from your having previously bought their stuff or is there some secret place you can sign up to get stuff sent for reviewing? Good question, Majo. A year ago - literally, in July 2010 - I answered an email from them asking if I had a blog and wanted to be on their panel of reviewers. Ooh, free goodies! You've hit the blog big time. I'm jealous. I keep hearing great things about these guys, but I'm not ready to shell out the money for a running skirt. Maybe some day. Thanks for the review, it's good to get the perspective of someone I trust! Hm, I hope Running Skirts is reading these comments about their poor service (and high prices...$48 for running bottoms????). T, if you're gonna review gear, you need better photos...hard to see details taken from the Nemty-eye level. I'd want to see the actual length of the shorts ON you, though I know you are loath to lift the hem and give us all a peek. Kate, that's a great idea about the pictures. The next time I wear it, I will take more and add them (fwiw). The length of the compression shorts on would certainly be a good one. Speaking of the length, though, I wore the skirt again yesterday (um, let's totally pretend I washed it in between wearings, okay?). The skirt - not the shorts - rode up some, exposing just a little bit of the shorts underneath. I still had a great run despite it, but it was the first time I've ever had a "I'm basically wearing compression shorts, what's the point?" feeling with a skirt.